Todd Bol’s mother, a book lover, died a decade ago. Two years ago, to honor her memory, Bol built a miniature library, filled it with books, and set it in his front yard in Huron, Wis. He and his friend, Rick Brooks, an outreach program manager at the University of Wisconsin, thought the idea could grow. It has. Bol and Brooks estimate there are 300 to 400 little libraries in 24 states and 8 countries. 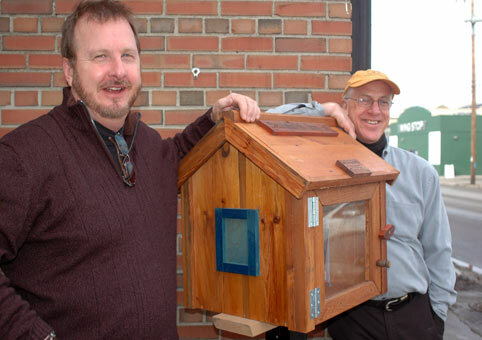 Their website, http://www.littlefreelibrary.org/, has plans for people who want to build their own, places to purchase the small structures, and a map to track their locations. This entry was posted in Books, Culture, Current Events and tagged 2012, books, Community, Culture, current events. Bookmark the permalink. This is great! What a wonderful idea. I would love to see these spring up all over the place. Thanks for telling me about this. I didn’t study the map in great detail but I saw that there is one in Sacramento. What a grand idea. I work in a long term care facility and think this would be a wonderful project for some of my residents: those who like to do workworking, and those who enjoy reading! Thanks for sharing. That sounds really good. Do check the website for some of the plans. In Coloma, California there is a thousand acre ranch that was purchased by the government as a recreation area. In the center, near the American River is an old cabin that was part of a movie set, directed by Michael Landon’s son. Inside the cabin is a shelf of books. Someone pinned a paper sign that says, “Hayduke Library.” Whenever I ride there I slip a book into my pack or saddlebag to leave. There are always different books there so I definately consider this a little library.